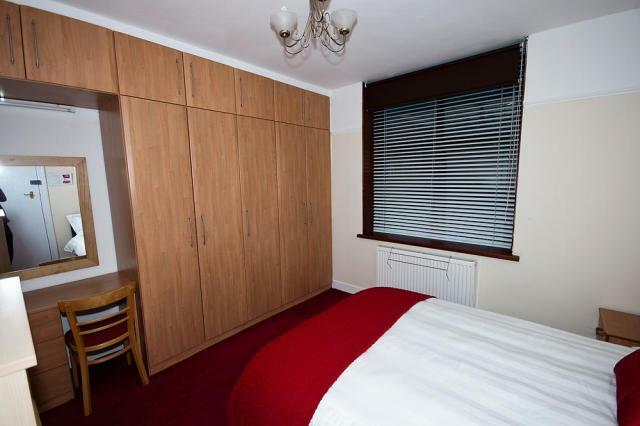 This good sized double bedroom has wall-to-wall built in wardrobes which provide excellent storage space as well as being an attractive feature of the room. A dressing table with mirror is included into the integrated wall cupboards. The room overlooks the rear of the property. Cost: £510 per calendar month room rental inclusive of all other charges. Built-in wardrobes along the length of one wall. Bed - Black faux leather Prado double bed with 25cm (10") memory foam mattress. This mattress is very firm. Click on any picture in the gallery to view a user controlled slide show. To progress from one picture to the next hold the cursor over the large picture and click on the > arrow.